I have a succulent lunch or dinner suggestion for you to enjoy over the weekend: shrimp stir-fry. But not just any stir-fry. This is an interesting and creative variation of our famous lomo saltado, made by my friend Roxana Salaverry, chef and owner of Manos Morenas, one of the best traditional restaurants in Lima, now closed. I published the recipe in a gourmet magazine I edited some years ago and it was a huge hit. 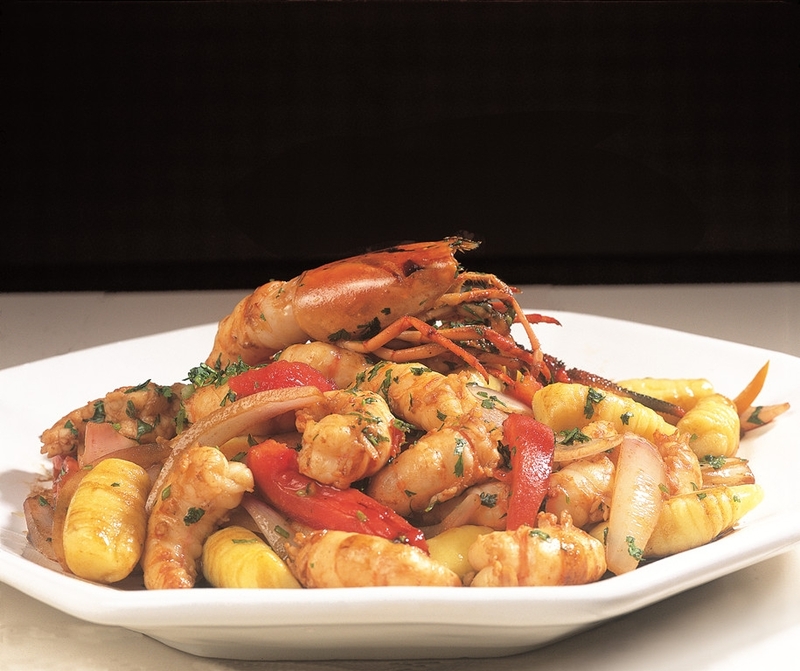 This extravagant entrée is not only exquisite but also original, because instead of the French fries, usual in our saltados (stir-fries), it has potato gnocchi, which makes it completely new and special. It´s a good idea to make the gnocchi yourself, because there is nothing like homemade, fresh pasta. Besides, working with the potato dough is relaxing and therapeutic. But the truth is that it is also labor intensive, so my advice is to buy the gnocchi already made if you don’t have the time or energy to spare, and this way the dish will be ready in a matter of minutes. You can heat the gnocchi in butter prior to serving, and maybe let them golden a little just for beauty’s sake. After all, food can be enjoyed with all five senses, and eating something that looks inviting is part of the pleasure. 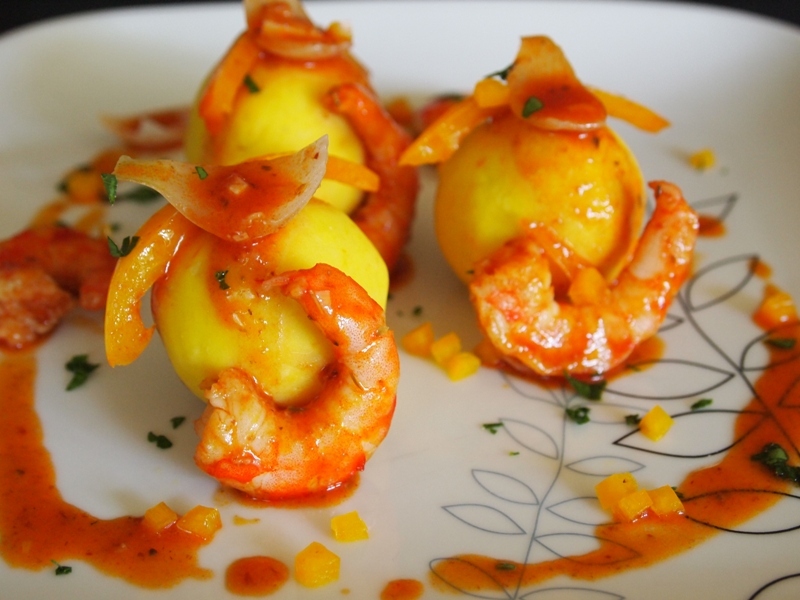 Habanero chilies are a good substitution for ají amarillo, but you can leave them out of the recipe if you don´t like spicy food, or use a little bit of ají amarillo paste instead. The recipe looks very long, but don’t be scared, if you don’t make the gnocchi yourself it’s much easier than it looks. Definitely worth trying. 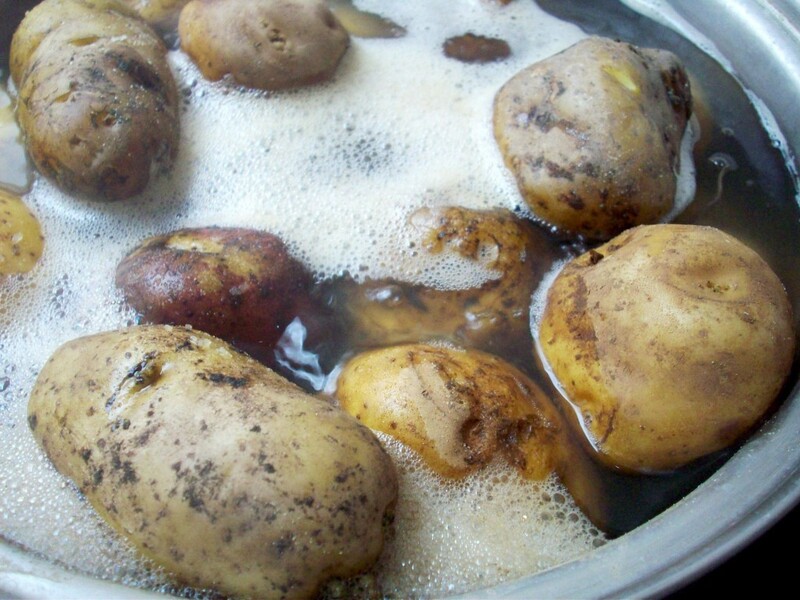 Cook and peel the hot potatoes, and strain them twice. Work in a floured table. 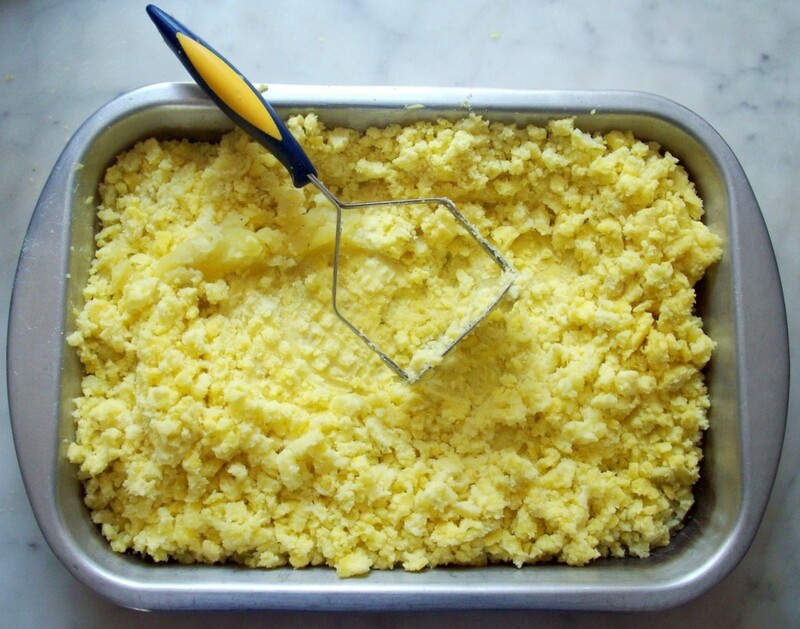 Put the strained potatoes; make a well in the center and add flour, baking powder, egg, and olive oil. Mix with your hands, but do not overwork. Separate the dough into several pieces. Working with one at a time, roll it like a cylinder, the width of your finger. With a knife, cut in ½ inch pieces. Press each one against the teeth of a fork, to form indentations. Repeat with all the potato dough, keeping the gnocchi in a baking sheet dusted with flour. To cook the gnocchi, bring a pot of water to boil, add salt, and lower the heat so the water doesn´t keep boiling, only simmers. Add the gnocchi, a few at a time, and when they rise to the surface of the water, take them out because that means they’re ready. Repeat with all the gnocchi. Put the cooked gnocchi in a plate and mix with a little butter. Reserve. Heat the oil in a wok or a skillet over very high heat; then add onion, garlic and ají amarillo or other chili pepper, stirring constantly. Add the shrimp. Stir and cook until they are pink. Add the tomato, soy sauce, vinegar, Worcestershire sauce, salt, and pepper. Stir and turn off the heat. Add the chopped coriander. Have ready 4 warm dishes. In each one, put a portion of gnocchi, over this, the shrimp stir-fry, and a line of balsamic reduction. 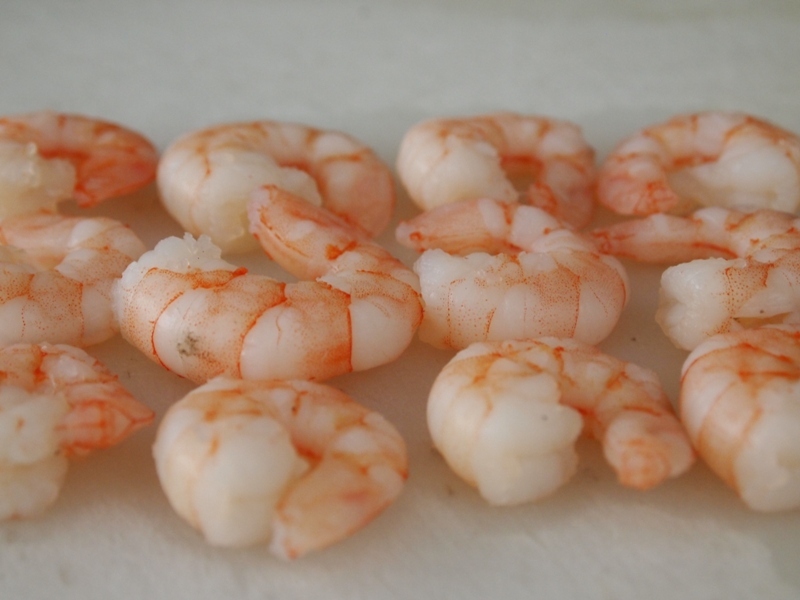 Finish with a whole shrimp, boiled or fried, for decoration. **To make the balsamic vinegar reduction, boil 1 cup of balsamic vinegar in a small saucepan until reduced by half. Wow! That picture is just amazing!!! And I’m sure the lucky person that ate the dish after the photo shoot said the same about the flavor!!! 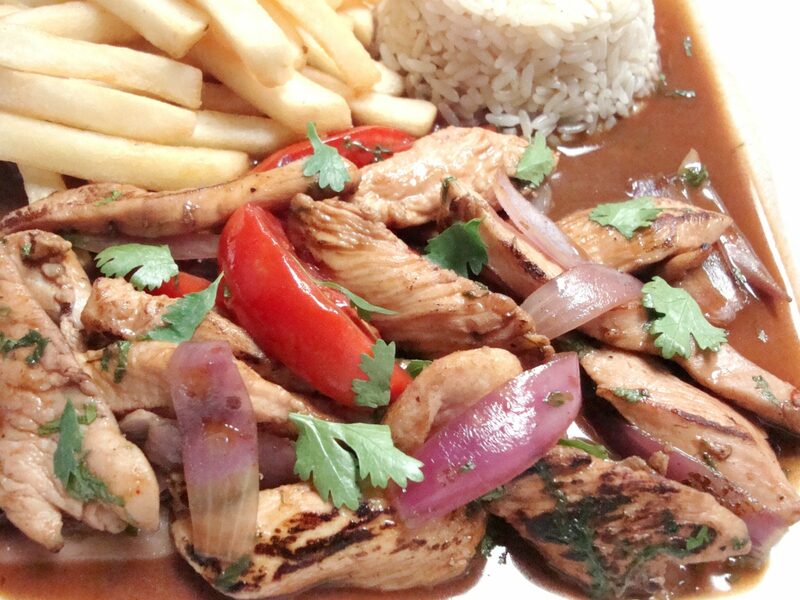 It was sooo good… Wish you were here to share this delicious saltado with us. 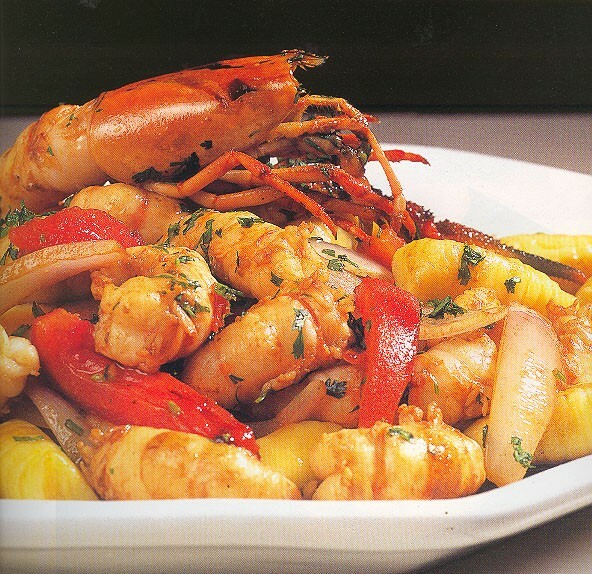 that little shrimp on top is scaring me but i love the concept and the gnocchi looks amazing! I love seafood, especially shrimp! This sounds like a great way to eat it! Thanks for sharing! stunning, lovely flavors and I have great local shrimp in my freezer!! You can then roll the gnocchi pieces with your finger over the reverse side of a fork to give it “gnocchi lines”.